Chad Meredith Hurley was born in 1977, he was the founder and former chief executive officer of YouTube a popular video sharing site. In June 2006, he was selected and included in the magazine Business 2.0 ranked number 28 as a list of "50 Who Matter Now". In October 2006 he and Steve Chen sold YouTube for $ 1.65 billion to Google. On October 16, 2006, Chen and Hurley sold YouTube to Google, Inc. for $ 1.65 billion. 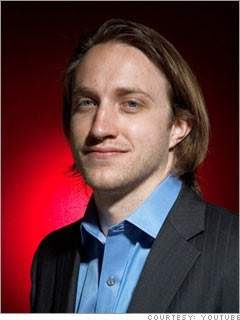 Reported in the Wall Street Journal that Chad Hurley shares worth 1.65 billion in sales from YouTube is 345.6 million U.S. dollars in Google, on February 7, 2007 at the closing stock price of $ 470.01 perlembar, he received 694,087 shares of Google and 41 232 shares in the trust . The other two YouTube founders Steve Chen and Jawed Karim, received 625,366 shares and 137,443 shares respectively valued at $ 326.2 million and $ 64.6 million dollars. The Journal reports based on Google's registration statement filed with the SEC on February 7, 2007. Hurley stepping down as YouTube chief executive officer in October 2010 and said he would remain as counsel of YouTube, Salar Kamangar allowing to take over the position of CEO. Hurley is married to Kathy Clark, daughter of Jim Clark an entrepreneur in silicon valley. They have two children ..